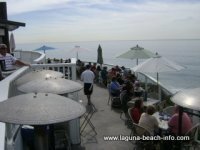 Enjoy this open-air oceanview Laguna Beach Restaurant. The Cliff Restaurant serves breakfast, lunch, and dinner perched right on the cliffs overlooking the ocean! The Cliff Restaurant is great for casual lunches and special occasions, with a spectacular 180-degree view of the Pacific Ocean. The Cliff Restaurant also hosts beautiful oceanview cliff Laguna Beach weddings, and offers catering for your special event! The Cliff Restaurant at Laguna Village is a beautiful location to perform an oceanview wedding on the bluffs above Laguna Beach! With a beautiful grassy bluff overlooking the sand and waves, they can help provide everything that you need to plan your perfect wedding day!